After Nikhil abducts them, Abhi and Pragya manage to escape from him but they are stuck in the jungle. They wander aimlessly and this way, Abhi seems to be having fun with the kidnapping as he receives warmth love and care from Pragya. Even as Pragya comes up with ideas, Abhi continues to wonders how intelligent and loving she is. When they get to spend time alone, Pragya talks sweetly which moves Abhi to get romantic with her at any chance they get. Nikhil is after them and becomes frustrated as Aliyah keeps taunting him. Meanwhile, Abhi spots a temple around them and decides to make Pragya his wife once and for all. 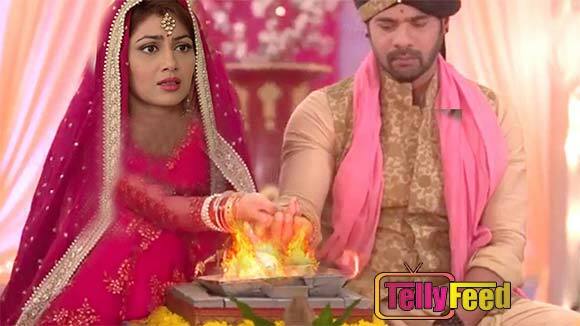 Abhigya start the rituals and are seen taking the wedding rounds. Aliyah and Tanu witness this as a goon sends them a video. Abhi finally ties the knot with Pragya and Tanu is burning with rage. Tanu looses control over herself by stating to murder Pragya as well as Abhi. She pledges to take her revenge on them leaving Aliyah shocked. In the meantime, Nikhil goons surround Abhi and Pragya after their marriage. What has destiny planned for the newlyweds now? We shall find out on the suspence thrilled Twist of fate!! Top Actor’s replacement this year.